Jema Jakonati: An Integrated Plan for the Environmental Management of Community Resource Recovery, (PIGARC in the Spanish acronym). This is a system for planning and implementing the management of ALL waste, solid and liquid, that can be found in rural communities, human settlements, other population centers, and even within cities. The fundamental and principal idea and objective is NO WASTE. Within a truly natural ecosystem, where the waste of one is the resource of another, we believe that true sustainability is only found in environments where there is no waste. Cyclical systems assure that resources, be it food, fuel or fiber for humans, or technological nutrients for industries, are not wasted. From this idea the modern recycle movement was born along with its well-known symbol. Our objective is to place EVERY material that is found in a community within a cyclical system of resource recovery. This is done through a program of education and action that includes community workshops tailored to children and adults, house-to-house guidance, public service announcements, and technical assistance with the project infrastructure and implementation. We employ a simple two-step management system. Step one is identifying all potential community residues and step two is identifying individual solutions for each residue. Organic Residues are all those residues that come from natural sources like leaf litter and food scraps. Organic residues utilize the natural process of decomposition, which is the most ancient and original form of recycling in the world. The technique of composting is the result of many millennia of human interaction with their environments. The resulting decayed organic material, compost, is the most beneficial plant fertilizer known to man. Composting and its product compost has been a pillar of human development since the advent of agriculture, even for early hunter-gatherers. 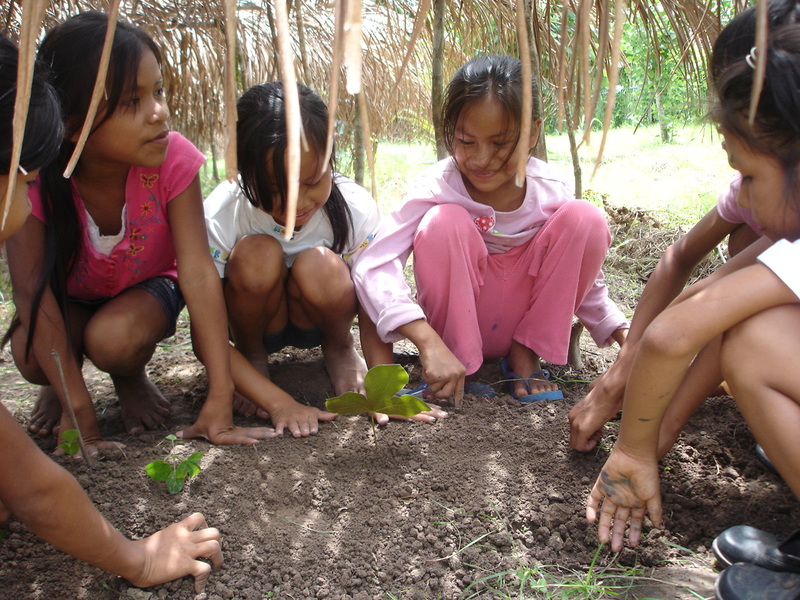 Thus, composting is nothing new to the Shipibo communities where we are implementing our projects. They have been placing their organic residues around fruit trees to fertilize them for generations. We use three different composting techniques with our projects, individual family composting around fruit trees and grey-water garden composting for small communities, and community-wide large scale composting for large and dense communities. Liquid Residues also fall under the Organic Residues classification residues from natural soaps, food, animals and the human body. Liquid Residues, commonly referred to as “Grey Water”, come from food preparation, washing, and bathing. The disposal of defecated and urine matter in water resources is referred to as “Black Water” and should be avoided unless a proper management system, such as an adequately designed and managed biodigestor, is utilized. While lots of “Grey Waters” may have synthetic and/or toxic materials, grey-water gardens have been designed to filter the water, capturing harmful residues while reutilizing all of the organic residues for food, fuel, and fiber production. The design we promote is called a “Banana Circle” and utilizes a banana root-lined pit that not only filters grey-water and grows bananas, but it also provides a space for composting. It is an All-in-One solution for Organic Residues. Human Residues are also Organic Residues that consist of defecated and urine matter. 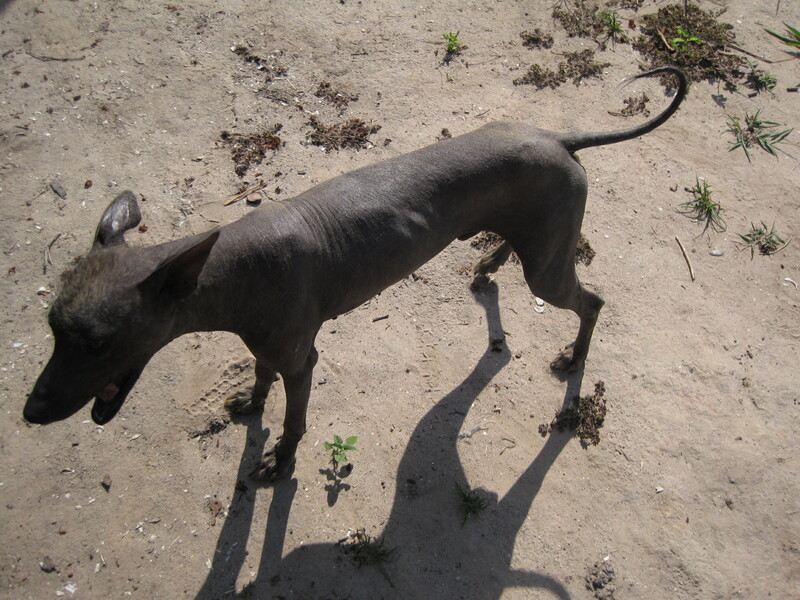 These residues can be managed through composting techniques, but one must use more care when working with human residues because they have the potential of carrying human pathogens, such as parasites and bacteria, that can make us sick. However, proper management techniques with biodigestors and waterless composting latrines can destroy human pathogens and recover the natural resources for plant fertilizer without putting our lives at risk. 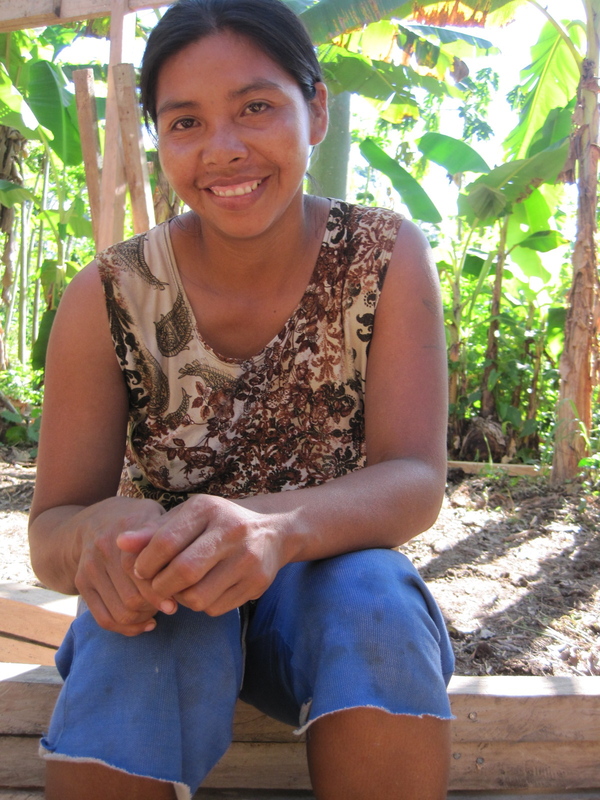 Waterless composting latrines are preferred and promoted for economic (much cheaper) and ecological (no water) reasons, and the final product is superior to biodigestors in relation to the sterilization of human pathogens and the amount of plant available nutrients in the resulting compost. The following types of residues consist of those that come from industrial processes. These are referred to as Inorganic Residues, which is to say “Not Organic”. The vast majority of these materials are complex plastics derived from hydrocarbons, but also includes heavy metals and other toxic mixtures. Unfortunately these residues are not readily biodegradable; hence other management techniques must be utilized. Within this classification we have identified three sub-categories: 1) Recoverable Residues, 2) Waste Residues, 3) Dangerous Residues. Waste Residues are residues, which have no industrial system for recovering the natural resources of the material. The majority of the trash that contaminates our environment is composed of these residues because they hold little intrinsic value to society and many people see no reason to hold onto them. Thankfully the vast majority of these residues are flexible plastics that can be easily compacted into plastic bottles and converted into a Recoverable Residue. Plastic bottles provide a vessel for non-biodegradable wastes that can be used as a building material (like a brick) when it is stuffed with compacted waste residues. Diapers can be composted and the sifted plastic materials can then be placed in bottles, leaving a very small percentage of true waste within the community. Dangerous Residues are residues, which are composed of toxic materials or are physically dangerous (sharp). These materials cause dis-ease and illness within all living things, even death. They can have seriously detrimental effects on the environment. The majority of these residues come from mining, oil, and chemical industries. Some dangerous residues are designed to be recycled, but many countries have neither the infrastructure nor the economic resources to recover and reuse the resources in these residues. Furthermore, those processes make much more waste as a byproduct. Many of these materials should be avoided altogether because they have few possibilities for recycling and require a high cost for disposal and care in a special landfill designed for dangerous residues. These materials are stored in plastic bottles until they can be transported to a center where they can be recycled (like batteries) or disposed of in the safest manner possible. The infrastructure of the project consists of two installations. The first is Resource Recovery Center (RRC). This is site for storing Recoverable Residues in large reusable sacks, Waste Residues that have been stuffed into plastic bottles, and Dangerous Residues that are stored in a semi-safe manner until they may be transported to the city to be recycled, or in extreme cases, disposed of in a special landfill for hazardous materials. Aside from being a storage center for residues and tools, the RRC also includes an example of a waterless composting latrine and demonstrates how Waste Residues can be reused to build walls and other useful objects. In this sense the RRC also serves as an educational tool for the community where members and visitors can go learn the WHAT, WHY, and HOW of Integrated Waste Management, and Permaculture Theory and Design. Within the communities where we work a plot of land 20 meters by 10 meters is recommended for the construction of a RRC that is 7.5 meters by 5 meters. The plot of land must be registered with a written declaration of possession declaring the land is the responsibility of the local municipality to serve as the RRC for the community. This is done to avoid potential land issues with other member in the community. The second installation is the placement of Resource Recovery Bins throughout the community to compliment the anti-litter education campaigning. 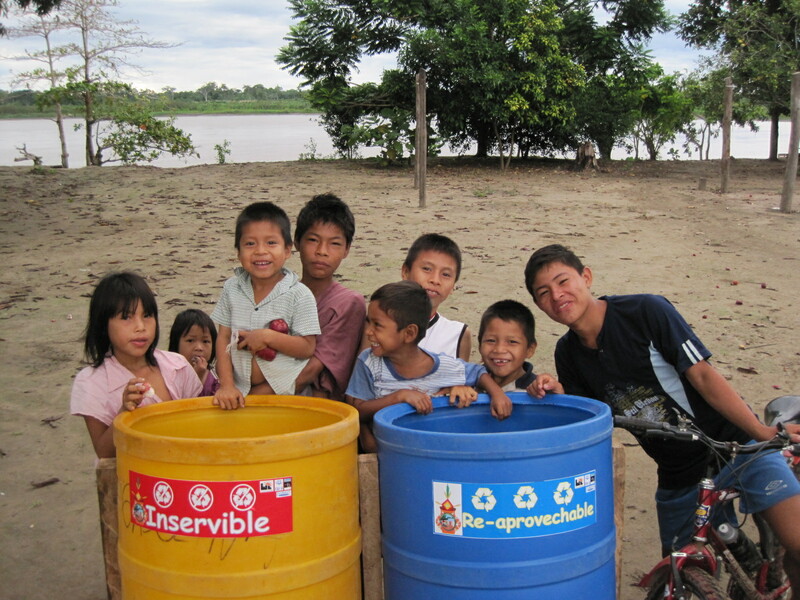 These bins are reused from local industries in regional capital city of Pucallpa. They are composed of a durable plastic that is quite resistant to solar UV rays and do not rust, therefore they last many years in the harsh tropical sun and heavy rains. Depending on the size of the community a cargo tricycle may be needed to help with daily, weekly or monthly collections. In most of the communities a tricycle will not be needed, but they are quite convenient and each community could benefit from one if the funding was available. This solution was developed from nearly a decade of study and testing with the pilot project San Francisco Saludable. It is a hybrid of innovative municipal solid waste management, permaculture practices, and traditional indigenous techniques. Projects are implemented within communities that express desire for a solution to their waste management problems. Once a community is identified we seek partnerships with the local municipalities and private funding to sponsor the project. We then begin the implementation of the project with a formal community assembly where our project director and district coordinator discuss project logistics and figure out what contributions to the project will be made by the community. A Resource Recovery Committee is also formed to help complete a baseline study of the community and promote the project. Based on the results of the study we will know what level of infrastructure and organization will be required for successful implementation. 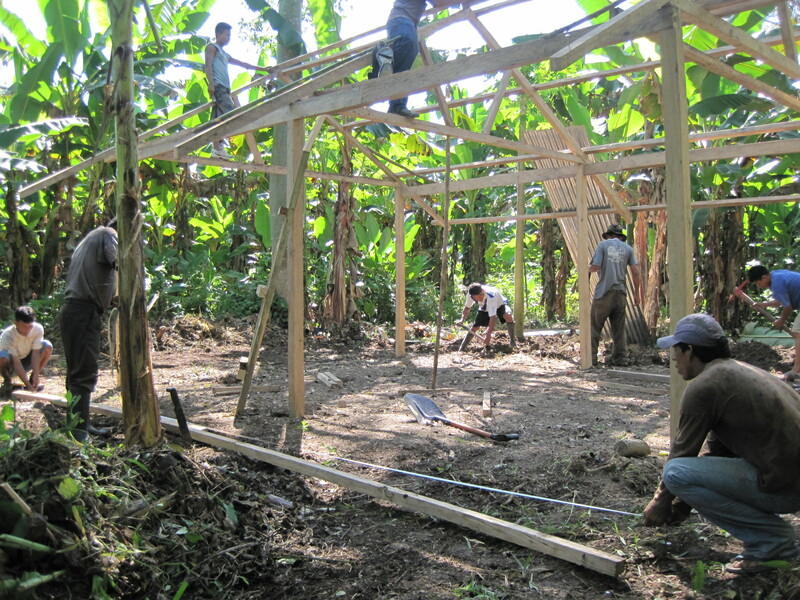 Currently we have five active projects, all within Shipibo “Native Communities”. The Pilot in San Francisco, the Pilot Replication in Nueva Ahuaypa, and further replication projects in Nueva Samaria, Roya, and Santa Rosa de Dinamarca. San Francisco’s project was formalized in 2008 and now functions as a municipal service within the community. The dense and large population requires the labor of two fulltime collectors who work Monday through Friday collecting separate materials and producing tones of compost at the San Francisco Saludable Resource Collection Center. However, a lack of responsibility from the current mayor of the District Municipality, Professor Edwin Diaz Paredes, requires the need for a monthly donation of $250.00 to pay one of the collectors. The project in Nueva Ahuaypa began in November 2009 and was formalized as a community municipal service in November of 2010. The replication projects in Nueva Samaria, Santa Rosa de Dinamarca, and Roya began in June, July, and August of 2011, respectively. These projects are all in the beginning phase are programmed to receive a year of technical and educational support until the project becomes the responsibility of the community Municipality. Continued observation and support from Allianza Arkana is provided indefinitely from our Project Promoters and Directors. We are also coordinating a formal agreement with the District Municipality of Iparia to pay the salary of our Upper Ucayali Coordinator, Lisenia Panduro Soto. Short-term – There are seven more communities that have been identified and are programmed to begin projects in 2011-2012. Four of these communities are part of the U.S. Embassy’s Military Assistance Advisory Group (MAAG) replication grant that were identified at the end of 2010, the other three were identified in January of 2011 through connections with others AA projects and our council of Shipibo Onaya Elders. We are currently working in three districts that correspond to the Upper Ucayali River, Middle Ucayali, and Greater Pucallpa geographical sectors. Long-term – As the projects continue to have successful implementation they are generating substantial interest from neighboring communities, native and mestizo, along with the District capitals. We foresee an almost exponential amount of inquiries for Project Replications, not only in the District where we are currently working, but in Districts down river that correspond to the Lower Ucayali sector. There are around 140 total Shipibo communities along the Ucayali and various mestizo settlements, presenting plenty of work in our long-term goal of a Region-Wide implementation within all the communities along the Ucayali, and then up the various tributaries and further down river into the Department of Loreto and other Amazonian Regions. In order for us to meet our short-term goals we need logistical support, which means we need more employees, namely two more local coordinators. One coordinator is needed to oversee and implement the projects in the District of Masisea (Middle Ucayali), and another to do the same in the District of Yarinacocha (Greater Pucallpa). These are fulltime employees who travel between and stay in the communities to drive the educational component of the project while keeping the implementation of the project infrastructure moving forward. With these employees in place we will have three District Coordinators who will be managed by the Project Director, who are all overseen by the Community Based Solutions Director. We also need further funding for material in all the projects that we are, and plan on implementing over the next 12 months. This includes Resource Recovery Center materials, construction, and equipment costs. Additionally we need to provide transport and food for the Directors and Coordinators while in the field working, and administration costs at the Regional Office in Pucallpa. Volunteers are also needed to help these projects go above and beyond expectations. There are currently four communities with Private Accommodation for volunteers and homestays can be arranged in two other communities. It has been months since our last post and I just wanted to share a quick update of all the advances San Francisco Saludable has made since winning the Ashoka Changemakers “Designing for Better Health” competition and a grant from the Clinton Global Initiative. First off, we were blessed to have made a connection with a Fulbright Scholar, Amanda Garratt, who has taken on the replication projects in two more Shipibo communities, Nueva Ahuaypa and Calleria. I will be asking her to add a post to let you know all the details of how the project evolved to meet smaller community needs. I have taken two trips to Ahuaypa to oversee the construction of their mini-landfill and was very impressed with the work going on there and level of commitment to the project by the community as a whole. The work on the landfill was completed in about 4 days, including the building of a tin roof and deep trenches to divert rain water away from the main trench. We stuck to a similar plan of the San Francisco landfill, but we made extra precautions to keep the rain out. Also in the same plan of operation NO TOXIC or DANGEROUS MATERIALS are permitted to enter this landfill. We realize that a landfill is not a true solution in waste management, but until solutions are made higher up the technological nutrient cycle we need to do something with dirty diapers and packaging materials. Along with the landfill, we also began putting up heavy duty collection bins throughout the community. These large plastic containers were used for transporting Alcohol amongst other liquids into the Amazon and are now helping to keep the rivers and communities clean, and they don’t rust! We have received a most excellent donation from a Shipibo healing center, the Temple of the Way of Light, (www.templeofthewayoflight.org) to pay a monthly wage to the volunteer environmental promoter in the community, Lisenia. We thank all those at the Temple of the Way of Light and look forward to opportunities this brings us for the expansion of responsible waste management along the Ucayali river. With a little more support we may have a Resource Recovery boat between Ahuaypa and Pucallpa, with the potential of working with dozens of communities. Lusenia is the president of the Resource Recovery Committee and has volunteered as the local coordinator for the project in Ahuaypa. ¡Icha birës irakë! The latest and most exciting news from the pilot project San Francisco Saludable is that the two collectors, currently Fabian Rengifo Cauper and Victor Alvarez Nicolas, have received work contracts from the district municipality. Preliminarily 2 months, this is a huge advance for the project and they are working hard to further demonstrate the value of the municipalities return in paying the wages of Fabian and Victor. Meanwhile Fabian has been extra busy reforesting 4 additional hectares (nearly 10 acres) while maintaining the 3 hectares (7.4 Acres) planted last year with support from Las Palapas Grill (www.laspalapas.ca) in Saskatoon, Canada through former volunteer Tessa Baker, another the artist Joel Harris http://www.laspalapas.ca (www.joelharrisstudio.com). 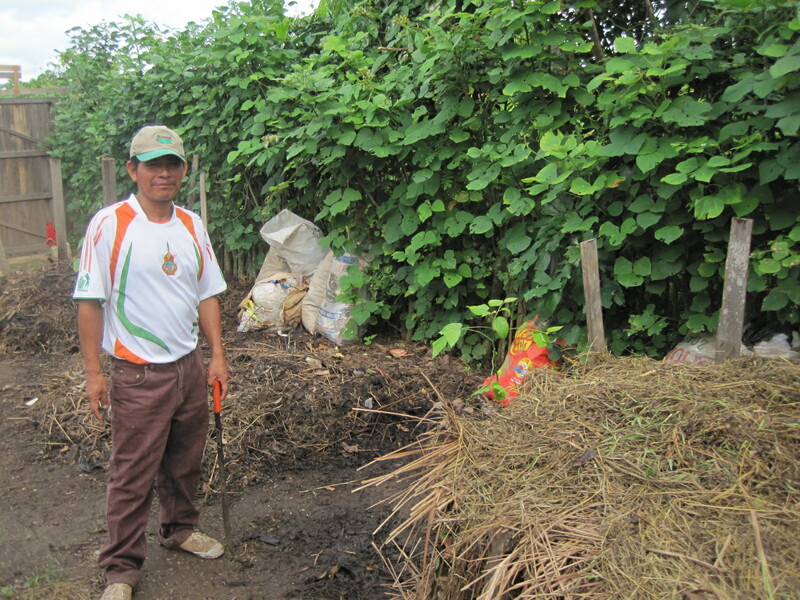 Fabian has been using compost to fertilize the soil in the agro-forestry plots. San Francisco Saludable has also partnered up with the primary school in San Fran where Fabian and Victor sharing their matured compost and producing more compost on site at the Garden. Yet again we were blessed to have an amazing volunteer, Nadya Bell, who took on the development of demonstrative gardens at the Resource Recovery Center, coordination of the school garden with teachers, parents and kids, and the preparation the nearly 400 mt2. plot. We thank Nadya so much for her amazing work and would also like to put the word out to any potential volunteers to please consider coming and helping out. There is so much more to do and we have a great house and a great family to look after you while you are with us. We would also like to thank the Captain Planet Foundation for their support, along with Maria Maute, a former volunteer who helped raise additional funds after returning home. Again, I hope to see more regular posting of the current advances of all the projects and would like to send out a huge hug and thanks to all those who have supported us over the past year. 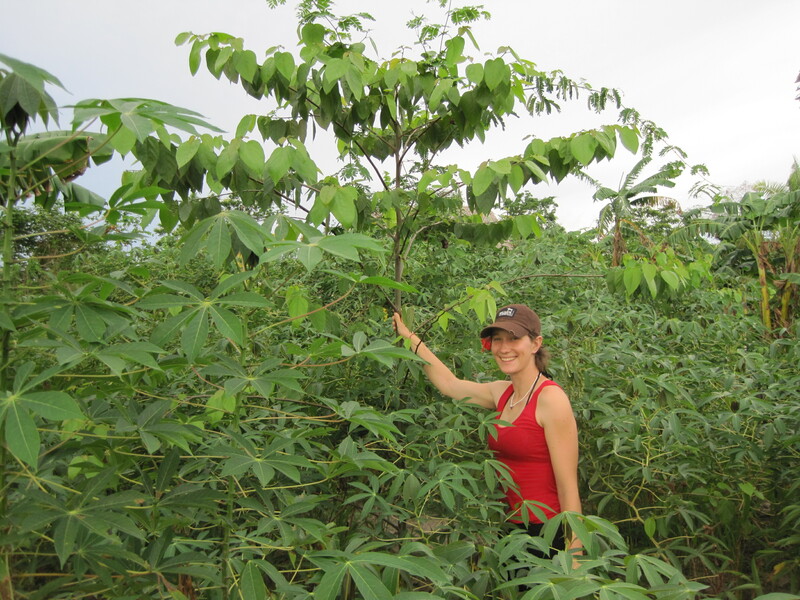 Nadya with a tree planted 10 months prior by the local preschool. San Francisco Saludable has received the honor of being named a finalist for “Designing for Better Health” competition put on by the Ashoka’s Changemakers initiative. Our project was selected out of 281 entries from 29 countries. Now there remain just 10 and we need YOUR help to win this competition and give our project a second year of funding to help us achieve a self-sustaining waste management service in San Francisco. 4: Search for the “Designing for Better Health” competition. Thank you all for your support and don’t forget to share this information with your friends and family.